Drive Chain - Hero MotoCorp Ltd. The service life of the drive chain is dependent upon proper lubrication and adjustment. Poor maintenance can cause premature wear or damage to the drive chain and sprockets. The drive chain should be checked and lubricated as part of the Pre-ride Inspection. Under severe usage, or when the motorcycle is ridden in unusually dusty areas, more frequent maintenance will be necessary. Turn the engine "OFF", park the motorcycle on its main stand and shift the transmission to neutral. Remove hole cap. Drive chain slack should be adjusted to allow approximately 25 mm vertical movement by hand. Rotate the wheel and check drive chain slack as the wheel rotates. Drive chain slack should remain constant as the wheel rotates. If the chain is slack in one section and tight in another, some links are kinked and binding. Binding can be eliminated by frequent lubrication. Turn the chain to view chain lock plate inside the hole. 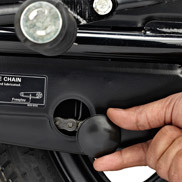 Ensure that the chain lock plate open end is installed in the opposite direction of the chain rotation. Inspect the sprocket teeth for wear or damage. If the drive chain or sprockets are excessively worn or damaged, they should be replaced. Never use a new chain with worn out sprockets since this will result in rapid chain wear. 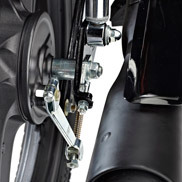 Park the motorcycle on its main stand with the transmission in neutral and the ignition switch in "OFF" position. Loosen the rear axle nut and sleeve nut. Loosen the drive chain lock nut. Turn both the adjusting nuts in an equal number of turns until the correct drive chain slack is obtained. Turn the adjusting nut clockwise to decrease the slack or anticlockwise to increase the slack of the chain. 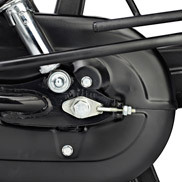 Align the chain adjuster index mark with the corresponding scale graduations on both the sides of the swing arm equally. If the drive chain slack is excessive when the rear axle is moved to the farthest limit of adjustment, the drive chain is worn and must be replaced. Tighten the rear axle nut and sleeve nut. - Rear axle nut torque: 5.4 kgf-m.
- Sleeve nut torque: 4.4 kgf-m. Check the drive chain slack again. Rear brake pedal free play and stop lamp switch free play are affected when repositioning the rear wheel to adjust drive chain slack. Check rear brake pedal free play and adjust as necessary. 1. Turn the engine "OFF", park the motorcycle on its main stand and shift the transmission into neutral. 2. Lubricate the drive chain by applying liberal amount of SAE 90 oil. Regular adjustment and lubrication as per the maintenance schedule would ensure high performance and longer life. Visit authorised Hero MotoCorp workshop for inspection, cleaning, lubrication and adjustment of drive chain at every 2000 kms. Turn the engine off, raise the rear wheel “OFF” the ground by placing a support block under the engine and shift the transmission into neutral. Check the drive chain slack in the lower drive chain run midway between the sprockets. Drive chain slack should be adjusted to allow the follow vertical movement by hand. Rotate the rear wheel. Stop. Check the drive chain slack. Repeat this procedure several times. Drive chain slack should remain constant. If the chain is slack only in certain sections, some links are kinked or binding. Binding and kinking can be eliminated by frequent lubrication. Excessive drive chain slack may damage the bottom of the frame or the chain could come off the sprockets. Rotate the rear wheel slowly and inspect the drive chain and sprockets for any of the following conditions. If the drive chain has damaged rollers, loose links or missing o-rings, replace it. If the chain is dry or rusted, it should be lubricated. Lubricate the chain if the links are kinked or binding. If the problem is not solved after lubrication, replace the chain. If the drive chain or sprockets are excessively worn or damaged, they should be replaced. Always replace the drive chain and sprockets as a set. Otherwise the new part will wear prematurely. Drive chain slack should be checked and adjusted, if necessary, every 1000 km. Lubricate every 1000 km or sooner if the chain appears dry. 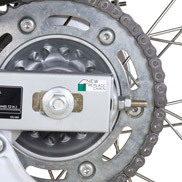 If after adjustment of drive chain slack the double headed arrow reaches the red line on the wear indicator label, the drive chain kit has to be replaced. 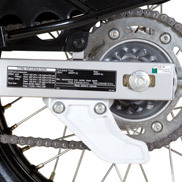 When a new drive chain kit is installed adjust the drive chain slack and then attach a new wear indicator label while aligning the double headed arrow with the black line on the label.